A dog always knows where to find his water when he's at home. The Poochable Travel Dog Bottle insures your dog has both clean water and food when he ventures out, and it adds very little weight to your load. The new Mookkie™ debuted at the 2019 Computer Electronic Show (CES) this month. 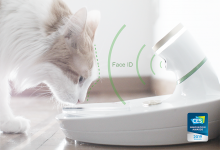 It is the first pet feeder to use facial recognition software to distinguish between your pets. There seems to be a sudden burst of calcium products on the market for pets, but the fact is most dogs and cats don't need them, and they could be harmful! Your pets may not be able to read their names on this dining set, but there will be no doubt where to find it. They can't miss the place mat! The pet food industry just won't let your dog get bored. Be happy that it's relieving you of the burden of getting your dog to eat "dog food." In addition to being a challenging treat dispenser, if your dog whoofs down his food, the Bob-A-Lot can slow him down and provide some entertainment while he's eating.